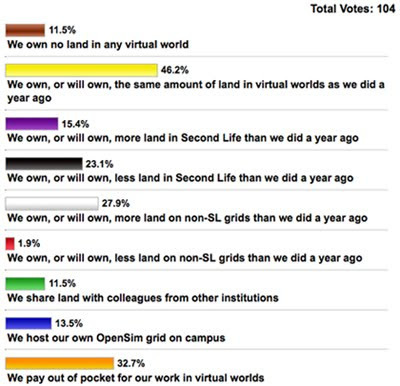 In March, I asked educators on the SLED and EDUCAUSE Virtual Worlds lists to tell me how their ownership of land in virtual worlds compares to their holdings a year ago. I had expected a larger exodus from Second Life, but the survey design made it hard, without biasing its design, to factor in the two-year pricing Linden Lab offered nonprofits and educational institutions. The two-year reduced tier may have swayed many colleagues with ongoing projects that are hard to transplant to stay in SL. With 15.4% noting that they would own more land in SL, and 23.1% noting that they would own less, there's hardly a mass migration out of SL to OpenSim or anywhere else. There may be a slow erosion of the user base among educators, but more data are needed for such a claim. A difference of 8% between contraction and expansion might sound alarming to a company in other contexts. I could imagine executives losing sleep if their aggregate sales figures showed a similar change: more companies in the prior calendar year expanding their trucking fleets with more Chevy trucks than Fords, or more firms supplying their employees with Windows 7 rather than Blackberry smart phones. For virtual-world users, however, the choices are not either/or: it is quite possible to rent server space from several providers to enable different projects. The survey respondents could, for example, have cut land holdings a little in SL, while renting server space for an OpenSim installation (or hosting it on campus). My own response would include "own less land in SL" (our campus presence has gone from a full island to my office, on a 512m mainland plot for which I pay no tier) and "own more land in non-SL grids" (I rent a sim in Jokaydia Grid). With 27.9% noting more ownership of non-SL real estate than a had been the case a year ago, versus 1.9% saying less, educators are clearly trying other grids, perhaps as secondary experiments alongside work done in Second Life. Faculty may simply be hedging their bets in case further changes from Linden Lab prove unsuitable to their needs, or they may be staking an early claim if OpenSim grids evolve in ways that make them match or exceed SL's stability and quality of content. One telling statistic: nearly a third of respondents pay out of pocket for their work in virtual worlds. That makes any further increases to tier difficult. For those paying the non-discounted tier in SL, it will be interesting to look again in a year, to see how many educators have changed their plans or stayed with Linden Lab's grid. Public knowledge of OpenSim has certainly grown; a year ago at the VWER meetings, we had to explain when OS is. Now folks know, even if they have not spent much time on a non-SL grid. In time, more will travel, and their experiences with grids not quite as evolved as SL's may influence future survey results. A different survey might ask respondents if they pay more, less, or the same tier as a year ago, or the size of their SL and other holdings. Moreover, another survey might break out the sorts of non-SL worlds that educators frequent. InWorldz, for instance, offers stability and the presence of many content creators; it is very different from smaller OpenSim grids with Hypergrid access and mostly DIY content. I hope, however, to administer the same survey a year from now. These numbers could be very different, and one survey cannot reveal a trend. Great piece of work. V useful.